The Black Book of Colors offers a rare opportunity to experience reading in a completely different way. Consider for a moment trying to describe a color, any color, to a person who is blind, a person who has never had sight. One might employ descriptors for sound, touch, and taste to give as broad an explanation as possible. This fascinating book takes on that difficult task, and does so beautifully. The Black Book of Colors was created to give sighted people a glimpse into the world of a non-sighted person. The expressive text is shown in white type against a black background and vividly describes several colors. 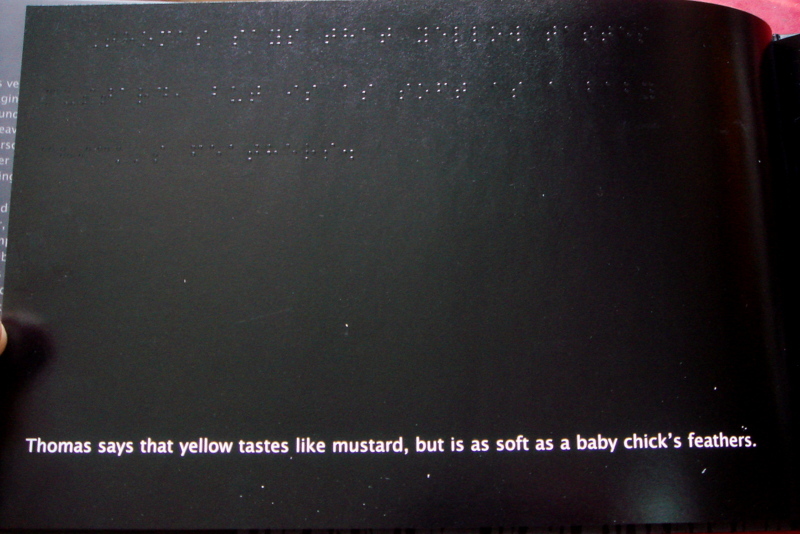 Above the printed text the same words are spelled out in braille. A tactile writing system for the blind, the letters are created with raised dots. The back page features the entire braille alphabet. 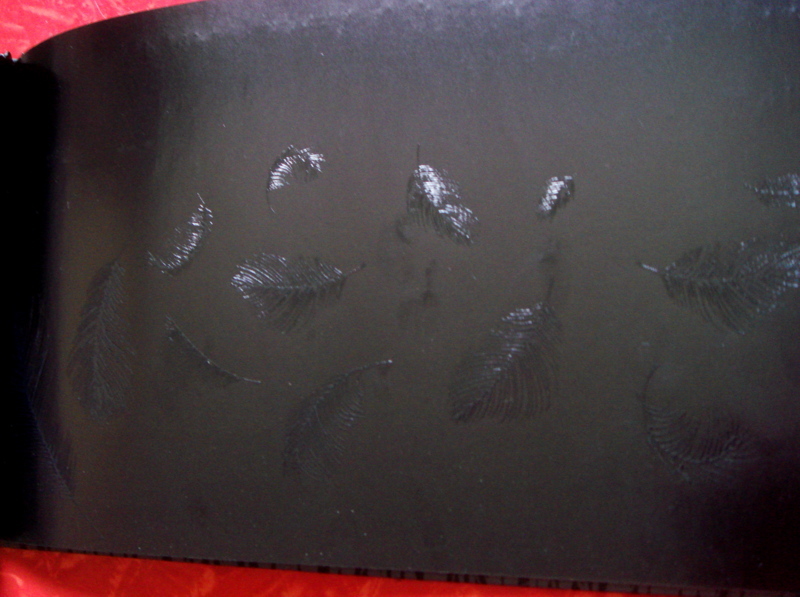 To encourage the reader to view the book with their hands, the illustrations are created in relief. The raised, black images are set against a black background. Though black on black, the images can clearly be seen—the art is glossy while the page is matte. I photographed these pages at an angle to demonstrate the effect. The letter-by-letter braille translation appears above the white, typed text. The start of a braille sentence is indicated by a single dot. Three dots creating an upper right corner mark the end of a sentence. On the entirely black page opposite the text, thirteen black feathers, of varying sizes, softly blow by. Red can hurt, like a scraped knee. Brown might sound like crunching leaves and sometimes smells like chocolate. Green tastes like lemon ice and smells like fresh cut grass. Black, soft as silk, is the king of colors. This innovative book offers children and adults a unique exercise in abstract thought, and a rare opportunity to experience reading in a completely different way. I’m a librarian; so, I already love books — but this is quite a find! I’m delighted to share your post, and excited about getting my own copy of this book! Thank you! This is fantastic! I’m always looking for books for my cousins that can expose them to experiences they might not be aware of of and I’m so happy that I found this one! Wonderful post and a unique perspective indeed. My mother was blind, not from birth though, and my then-7-year-old daughter read to her frequently and described things to her in a way that adults filtered. My mother enjoyed it tremendously.